In 2017 Arc launched a call out for an artist to work with three groups of women in Greater Manchester exploring the theme of Identity, eventually commissioning recent MMU graduate Jasmine Walne. In October 2017 ‘Cherish’ was launched, which was designed to enable women from different communities and locations to connect, collaborate and share their experiences and stories. 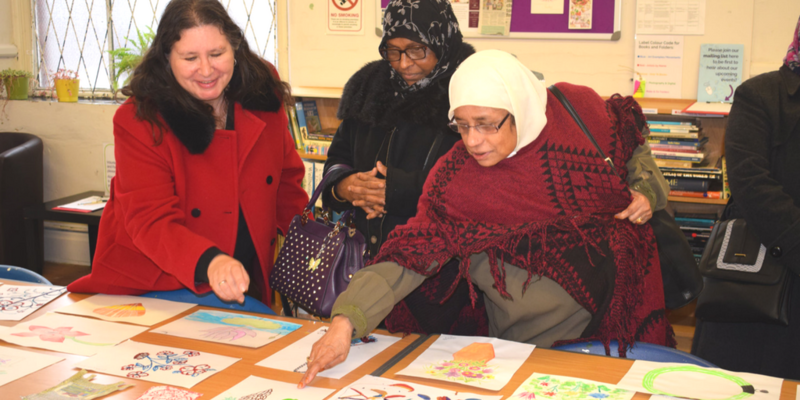 Since October 2017, artist Jasmine Walne has been working with three groups of women; Arc participants, Stockport Women’s Centre and Manchester Bangladeshi Women’s Organisation. Arc also fundraised for an artist to work with our partner organisation in India, Roshni. Together they explored the theme of “Identity” through looking at cherished objects from the home, and documented these in a series of creative workshops, through drawing, painting, collage and mixed media. And through sharing stories about their objects and lives, they have connected with each other. The groups came together to share their collective work, which will inspire large-scale digitally printed banners created by Jasmine. The exhibition will launch in the Arc Centre Gallery on 24th February in time for International Women’s Day, and will be open to the public weekdays 10:00-16:00 until 16:00 on Friday April 20th.